This Golden Turmeric Unsweetened syrup is bursting with flavour and goodness. A blend of turmeric, ginger, black pepper, cinnamon, and organic vanilla, it is easy to use, and utterly delicious both hot and cold. Delicious as a turmeric latte, in hot or cold milk, over ice, or you can add it to smoothies, shakes, cooking or desserts. This 300ml bottle is perfect for home users looking to add a little sunshine into their day. 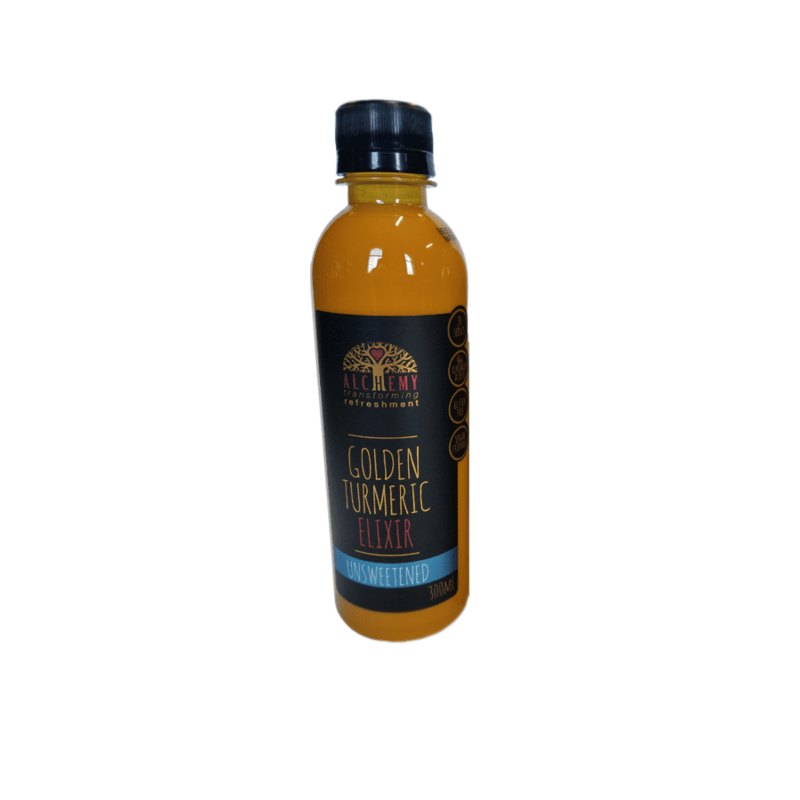 If you are a retail health food store, gym or deli for example, and would like to sell the 300ml Golden Turmeric Elixir, get in touch with us. The first thing you notice about the Golden Turmeric Elixir is the colour, both in the bottle and in the cup. It’s brilliant golden yellow hue is so vibrant that you almost can’t believe it is natural. The colour comes from natural curcumin, which is the bioactive ingredient in turmeric. The Elixir is an all natural blend of turmeric, ginger, black pepper, cinnamon, and organic vanilla. This recipe still has all the functional goodness of the original and has no added sugar or sweeteners of any kind. Delicious in hot or cold milk, or you can add it to smoothies, shakes, cooking or desserts. Just add 15mls of Golden Turmeric Elixir “Unsweetened Blend” to 200ml of hot or cold milk/mylk of your choice and enjoy the exquisite combination of beautiful flavours. Add honey, agave, coconut sugar or the sweetener of your choice if you wish! Only a handful of ingredients go into this Golden Turmeric Elixir, no nasties like artificial colours or flavours. Every ingredient contributes to the overall flavour, yet they are all functional and important contributors to what is our Golden Turmeric Elixir. 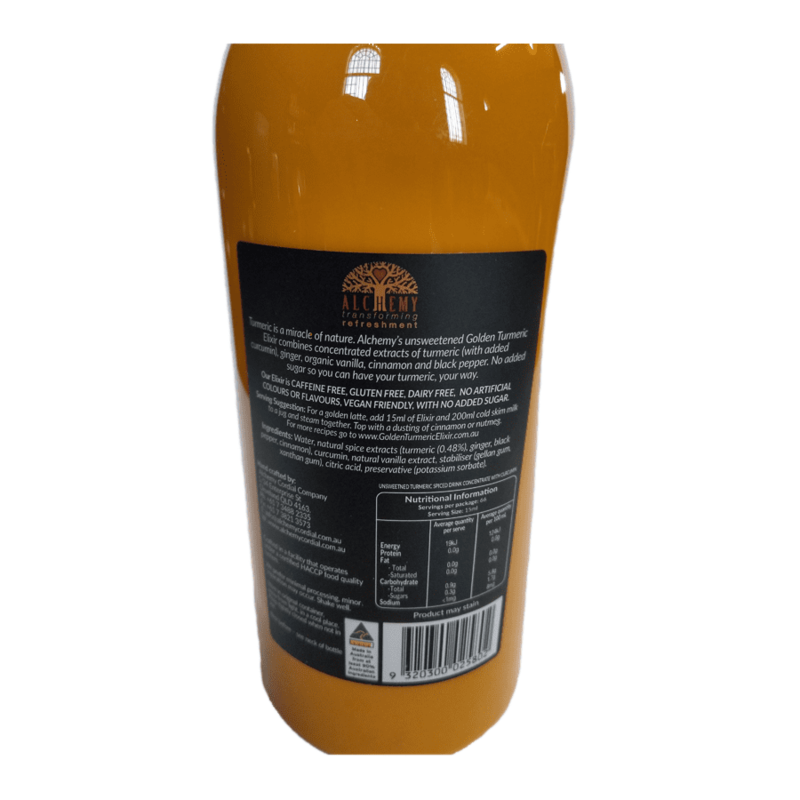 List of Ingredients: TURMERIC SPICED DRINK CONCENTRATE WITH CURCUMIN. Water, natural spice extracts (turmeric (0.48%), ginger, black pepper, cinnamon), curcumin (2.4%), natural organic vanilla extract, acidity regulator (citric acid).